Losing streak is not sustainable given how our possession stats have improved over the past 5 games. finish a strong development year by placing just 1 pt out of the playoffs, then shock the world by winning the draft lottery and picking first. what are the odds of the last elligable team winning first overall? like .5% or something? I’d rather they unload a veteran for a 1st rounder, make the playoffs, and then win the lottery with the 1st they acquired. But honestly, people can’t really think this team is making the playoffs… This has been fun and all, but we’ve become like the guy at the slot machine who wins a few in a row and thinks he has beat the system, is on a hot streak and starts to double down. Like the guy who got lucky in the casino, we should cash out and run now. Unfortunately we have to play the rest of the games this year. 0.5% was the prior number. Rick Nash disappears in the playoffs, the only time he took CBJ to the playoffs they got swept by the Red Wings. Last year, the Rangers had to send out a search party multiple times in the playoffs to find out if this guy existed. CBJ has had more post-season success without Nash. Last year they pushed the Penguins to six games. If not for the bad rash of injuries CBJ would be flying right now. Any thoughts on the great break away highlight reel goal he just scored to give the Rangers the lead? I don’t deny that Nash is a power forward and a goal scorer. He is a talented player and is off to a blazing start, but he is a me first guy. He asked for the trade out of CBJ, yes he wanted to win a Cup. He had a golden shot last season, granted they faced a powerhouse Kings team. The Rangers took the Kings to overtime in multiple games. Nash had many chances to rise to the occasion but he didn’t. Had he scored 14 like Gaborik did in the playoffs it might be a different story. It was a great goal and the Flames got caught flat footed on that one. Can I safely assume you don’t like Rick Nash and will not be trying to start up a Rick Nash fan club anytime soon? Well I guess he’s sure showing me tonight, sheesh. Regardless I totally agree with your previous comments. Although talented he only plays when he feels like it. He gets a pass on his laziness because of his high draft status! I like Nash but he’s not a sniper. We need a player to throw on a line with Gaudreau that is a pure goal scorer. That guy gets ripped by half the fans in Edmonton, but is anyone really surprised he’s struggling with that team? He’d be lights out on most other teams. That’s why he’d be perfect. If you really want to goad an oiler fan, remind him how much GlenX has been a warrior for the Flames since they let him walk. I’m always stunned by how young our forwards are. We have 1 centre over the age of 12. Is that “the” Hayes that Johnny Hockey played with, or his brother? 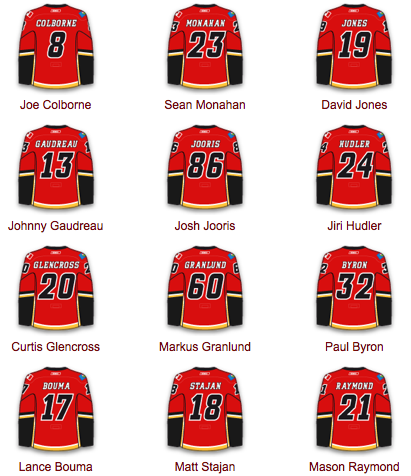 It will be entertaining to see Gaudreau go up against his former linemate. It would have been even better if Arnold were called up to make it a full reunion! Hayes has surprised me. He’s been giving similar deployment to Gaudreau and has 11 points. I honestly figured his huge improvment during his last season in B.C. was primarily Gaudreau effect, but he’s proven me wrong. The Rangers lucked out by getting him inked this summer. Hopefully Raymond finds his groove again tonight. 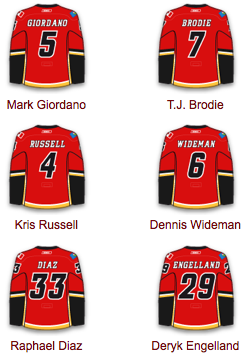 Bollig and Engelland seem like nice ppl and good ‘room’ guys, but I am not sure how they help this team. When playing the game of hockey if you have 18 highly skilled forwards and defensemen in your starting lineup that are soft and do nothing but try and score pretty goals then you finish in 29th place in the final standings. 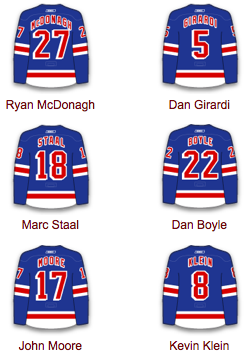 If you dress players like Bolig and Engelland then they bring grit and toughness to your lineup. They provide some room and braveness to your skilled players. The expectation is also that they not focus on goal scoring and pretty plays but rather knock some bodies around and protect some of our tiny skilled forwards when the time is warranted. Except we dont see these players even doing that? Was Bollig and Engelland not on the ice when Smid was hit? I dont see Bollig doing a whole lot hitting out there….am I missing it? Honestly the games I have seen live (TV is a poor measure) they play a tough game. They finish there checks and it appears they try and hurt some bodies. i admit we need an upgrade with the 3rd pairing on D but highly skilled physical defensemen are difficult if not impossible to find. I view these guys as gap players until Ferland, Selloff, Wotherspoon are ready for prime time or we are able to pull off a trade without giving up high end prospects! Not sure how the latter can happen! Big is and tough are good qualities for a hockey player, but only after a high hockey IQ, speed and skill. Neither Bollig or Engelland have enough of the prerequisites to be good NHL contributors. As for focusing on scoring, Bouma doesn’t put up big numbers and he still gets props around here. Really though……Ferland for Bollig please. If that’s the case I’d rather them bring up Ferland and send down Bollig. I still think we should stick the rebuild no need for trading away prospects for a player to make us a playoff bubble team. The Adirondack team seems really good and in 2 years we should be a solid team led by Monahan, Bennet, Brodano, Gaudreau, and Ortio. Also Ferland is seeing far more playing time in the AHL. why would you rather have him being a game time decision to play 4th line right wing? He should be in the AHL for now just to see more playing time. Agree. Ditto for Arnold, Sven, Agostino, Wotherspoon, Selloff etc. That’s one of the best periods I’ve ever seen the Flames play while racking up a 2 goal deficit. They must be ready to scream into a pillow. This is getting silly. Steinberg thought there would be a 90-95% chance that the Flames would dress Potter tonight given the massive dropoff on the last pairing. I guess not. 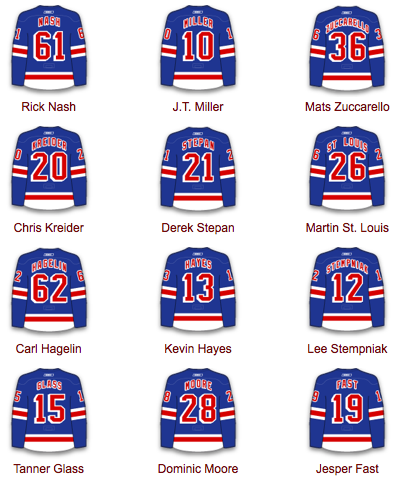 Raymond on the fourth line should be a wake up call for him. If they keep playing well then the bounces should go their way again and hopefully they can get some puck luck at home and start winning again. The timing of the vets coming back and losing may be a mere coincidence for some but for others there maybe a changed dynamic in the dressing room. I don’t know any coach that would sit guys like Colborne, Stajan or Raymond consistently when healthy, but I would have like to have seen them stick with the same lineup on the road trip. It may take some time for Raymond and Colborne to get back offensively to where they were prior to injury. I have no clue why people are counting on Matt Stajan for offense. If he scores a goal that’s a bonus, he’s a checker, penalty killer and a face-off guy. He’s not the second line center he was in Toronto. Not sure what else Russell could have done? Gift wrap it for Ramo? The Flames looks like hot garbage tonight, this is getting ugly.